Glenmorangie is releasing a whisky created using a local strain of yeast found in its barley fields as part of its Private Edition series of experimental malts. Glenmorangie Allta – Scots Gaelic for ‘wild’ – is thought to be the first Scotch whisky produced using a new strain of yeast. The strain, called Saccharomyces diaemath, is said to have been discovered by Dr Bill Lumsden, Glenmorangie’s director of distilling, whisky creation and whisky stocks, growing on ears of barley close to the distillery in Tain. The wild yeast was cultivated from the barley field and then propagated in a lab for use during the fermentation process. Lumsden said the Saccharomyces diaemath imparts more floral, bready notes to Glenmorangie’s new make spirit that ‘are not as accentuated in the house spirit, which has more herbal, fruity and pear drop aromas’. After maturation for around eight years in mostly second-fill and refill ex-Bourbon casks, Glenmorangie Allta (51.2% abv) is said to have aromas of ‘carnations and Parma violets, baking bread and very gentle vanilla’ with notes of ‘butter candy, creamy vanilla, orange syrup’ with a ‘slightly yeasty background’ on the palate. Lumsden said: ‘Glenmorangie Allta is a worthy whisky with which to mark the Private Edition’s 10th anniversary. ‘Yeast’s influence on taste has been overlooked for years, but it’s an area ripe for exploration. ‘Ideally I’d have liked to age it for longer but I was concerned that with the ever-increasing influence of wood we’d lose the impact of the yeast itself, which was at its maximum in the new make. That’s why we used only second-fill and refill Bourbon casks. As one of the three ingredients used in the production of Scotch single malt whisky, alongside barley and water, yeast plays a significant role in the creation of flavour. The majority of whisky distillers use distilling yeast to maximise yield, although some have been experimenting with less efficient strains that can produce different flavours. Glenmorangie’s exploration of yeast began at the turn of the century after whisky writer Michael Jackson laid claim that the distillery had cultivated its own house yeast in his book, The World Guide to Whisky (1987). 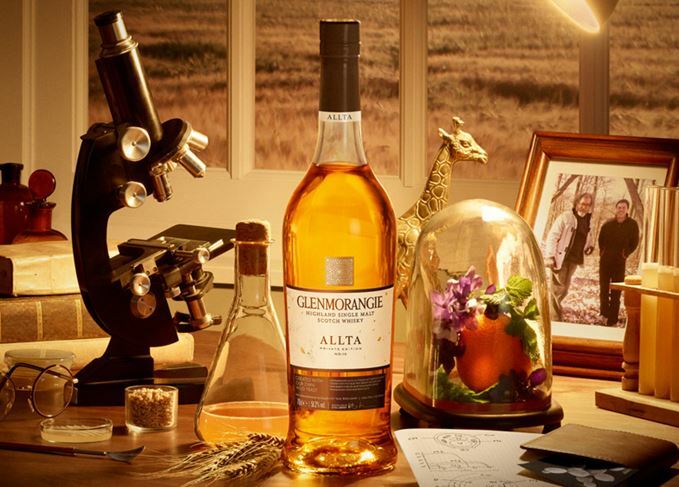 After finding no evidence that the strain existed, Lumsden, who has a background in yeast physiology and was at that point distillery manager, decided to cultivate Glenmorangie’s own house strain of yeast. The distillery began introducing the house strain into its production process around 2010, although it continues to use industry-grade yeast for the majority of its whisky. Now in its 10th year, the Glenmorangie Private Edition series has explored flavour innovation in Scotch whisky, with each expression released as an experimental twist on the Glenmorangie Original 10 Year Old. Previous editions have included Glenmorangie Ealanta (2013), matured in virgin American oak casks; Glenmorangie Tusail (2015), made using floor-malted Maris Otter barley; and Glenmorangie Spìos (2018), matured in ex-American rye whiskey casks. Glenmorangie Allta is available for £79 a bottle from specialist whisky retailers worldwide from today (29 January). You can buy this bottle at The Whisky Exchange and The Whisky Shop. It may also be available from these other retailers. The ninth release in the limited edition series has been aged fully in ex-rye whiskey casks. Bill Lumsden tells us how the concept of the Madeira-finished Private Edition release developed. If whisky enthusiasts hate on NAS, caramel and grain, it’s only because they really love Scotch.